The pleasing tone, the playability, the excellent tuning stability and ease of tuning, are outstanding features of our vertical pianos. All Walter pianos have a 12 YEAR FULL WARRANTY against defects in parts, material and workmanship. Our professional studio pianos are ruggedly designed to meet the most rigid school specifications and long hours of student practice. The extra-thick butcher block keybed, solid hardwood (Walnut, Oak, Mahogany, Cherry, and Ebony) legs and toeblocks, and ball bearing, double-wheeled casters make this piano ideal for situations where the piano must be moved frequently. At the same time, the clean lines of this design and recessed toe-block present a more stylish appearance. Our decorator console piano has the same rugged construction as the professional studio but is enhanced by elegant cabinetry, attractive styling, and a variety of cabinet motifs to match any decor. The Walter console is the largest vertical piano available in a home decorator style giving both full sound and beautiful cabinetry. Solid lumber material combined with hardwoods and a lacquer finish make this piano the choice of those looking for the finest in both sound and cabinetry. The Walter Grand Piano contains the finest grand action, custom made by Renner for the W190 piano. All external trim, including the heavy casters, are of solid brass. All case parts are of lumber-core and solid hardwood construction. All parts of the piano are carefully sanded, given multiple coats of specially formulated lacquer, hand-rubbed and polished. All Walter pianos have a 12 YEAR FULL WARRANTY against defects in parts, material and workmanship. Delignit pinblocks from West Germany incorporate twenty-nine plies of quarter-sawn high quality beech. The plies are permanently bonded with hot-curing phenolic resin glue to provide superior age and "wear" characteristics over maple. The extremely high pressures used in the gluing process produces very thin glue lines and increases the density of the wood. It is virtually impossible for reparations or delamination to take place even when soaked in water. The Delignit pinblock provides superior tuning stability throughout the life of the piano and is the pinblock material used in the world's finest European grands. Nickel-plated heads provide rust protection to the exposed part of the pin without diminishing the better holding power of blued steel inside the pin block. The direction in which the pin threads are cut creates a "reverse torque" characteristic for improved tuning stability. The scaling across the break may be observed by comparing the length of the longest plain string on the treble bridge with the length of the first copper-wound string on the bass bridge. Just as in almost any seven foot grand (or larger), the plain string is much longer than its adjacent wound string. Inadequately designed pianos will sometimes even put wound strings on the treble bridge where the plain strings automatically end up shorter than the neighboring wound string. This is never done on a large grand piano where fine tuning is expected. The speaking length of the longest bass string in a Walter Piano is 48 1/4" (overall string length is 57 1/8"). This is comparable to a 5' 8" grand piano and is longer than the longest bass string in most fifty and fifty-two inch professional studio uprights. By contrast, spinet pianos have short, think (stiff) bass strings which give "clashy" tones, while large grand pianos have longer, thinner strings which develop better bass tones. Tail lengths below the bridges have also been carefully designed to further assist the desired tonal response. Solid copper is used in all string windings. The piano plate, poured of grey cast iron, is ruggedly designed to withstand the tremendous tension forces of the strings with minimum dependence on the back. Greater stability and longer life are the result. A fully-tuned piano exerts nearly twenty tons of compressive force on the piano plate. More screws combined with pressure support pads provide greater rigidity and more accurate depth positioining of the pressure bar. This maintains even string spacing and contributes to greater tuning stability. A 5/32" round rod is used as the treble V-bar to insure a precise point of contact where the speaking (vibrating length) of the string begins. This assures proper string support and avoids inaccuracies from uneven filing when a raised portion of the casting is used for the V-bar. A special groove in the plate is ground under the rod to assure solid seating. Both the treble and the bass bridges are notched above and below allowing them to vibrate more freely. This is important since the function of the bridge is to transfer the vibrations from the strings to the soundboard. If the vibrations are not transmitted clearly, it is impossible to obtain quality tone. 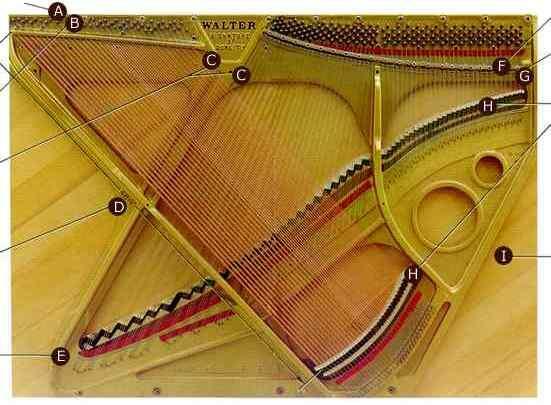 Finer grand pianos always notch both sides of both the bass and treble bridges. Failure to notch the lower portion of a bridge can result in unwanted buzzes later in the life of the piano. Sitka & Bavarian Spruce soundboards are both recognized by musicians as superior in sound transmission characteristics to other woods and laminated soundboards. Sitka Spruce is light in weight, high in strength, with long, parallel fibers that allow it to vibrate freely. The soundboard thickness is tapered to make it stiffer in the treble and more flexible in the bass. It is therefore more responsive to both treble and bass tones. Pressure bar screws are threaded into the plate rather than into the pinblock allowing the soundboard to extend two inches higher than is possible in other pianos. This increased soundboard height brings out the improved characteristics of the W-48 scale design.